Wilshire Skyline has secured $25 mil in financing for The Line Lofts, a newly completed, architecturally inspired community in Los Angeles’ iconic Hollywood neighborhood. The development, located at 1737 N. Las Palmas Ave, just northeast of the high-profile intersection of Hollywood Blvd and N. Highland Ave, is comprised of 82 residential lofts and flats and a robust collection of hospitality-inspired amenity spaces designed to act as an extension of each residence. The new financing, arranged by HFF’s Mark Wintner, is a 10-year, 4.45% fixed-rate loan that was funded through a correspondent life insurance company. The non-recourse loan replaced existing construction financing and includes a $5 mil future earn-out component at stabilization. The loan is among the first of its type to close through a new debt program that allows borrowers to close on long-term loans and lock in lower interest rates prior to being fully stabilized if the development can support strong underwriting and high appraisals. The property, which celebrated its grand opening on Memorial Day weekend, achieved 75 percent occupancy within its first four months. 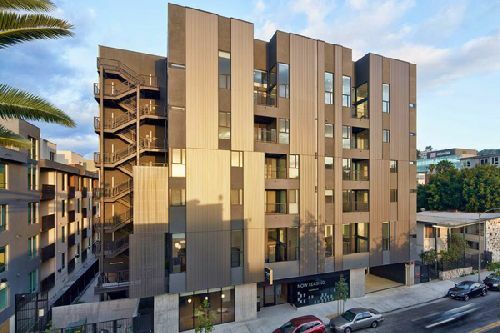 The Line Lofts was designed by award-winning architect Zoltan Pali of SPF:Architects. The six-story, Class A property blends modern architectural elements with energy-efficient, open floor plans ranging from 415 sf to 1.5k sf, featuring luxury kitchens and baths; double-pane architectural windows, which optimize natural light and views of the city and the Hollywood Hills; wood-grain plank flooring; and atrium-style outdoor balconies. Common areas include The Sky Lounge, a penthouse-level lounge providing unobstructed views of the city; The Retreat, an indoor/outdoor recreation center with a kitchen and lofted library, which opens to the outdoor pool and spa deck; The Wellness Spot, a lobby-level gym; and ground-floor retail. The property, which has a WalkScore® of 97, offers a menu of various concierge services and offers immediate access to some of Los Angeles’ top retail, dining, nightlife and recreation destinations as well as two metro stations and U.S. Highway 101.